No photo can do justice to the scenic grandeur of the dune fields of Great Sand Dunes National Park. The dunes rise 750 feet above the San Luis valley. Amazingly, these dunes formed on the eastern edge of a broad valley located in the middle of the great Rocky Mountains. Immediately to the east of the dunes are the jagged sawtooth peaks of the Sangre de Cristo mountains. According to science, it is these mountains that block westerly winds carrying the grains of sand. 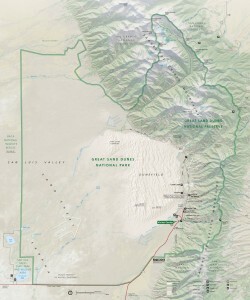 Much of the Great Sand Dunes National Park is also protected wilderness. The wilderness area is located within the boundaries of the Great Sand Dunes National Park and is administered by the National Park Service. A primitive road, Medano Creek Road bisects the wilderness into two separate areas, but allows for easy 4WD access and road-side camping. 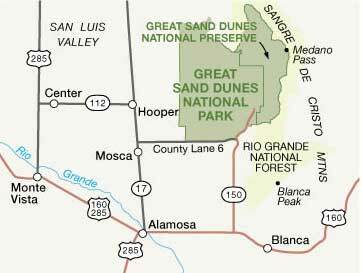 The sand dunes were formed over millions of years as individual sand grains were eroded from the mountains and deposited on the western slopes of the Sangre de Cristo mountains. Medano and Sand Creek’s seasonal flows fenced in the sand and kept it from being blown away. Together the natural forces of wind and water worked to build the tallest sand dunes in North America. The park and preserve contains the dune field along with the ponderosa, spruce, and aspen forests and the peaks of the Sangre de Cristo mountains to the east. Medano Creek flows through the middle of the park and delights visitors during May/June with a seasonal sandy water playground. The park and preserve is located at the end of Hwy 150, near the city of Alamosa. From Alamosa, head east on Hwy 160. 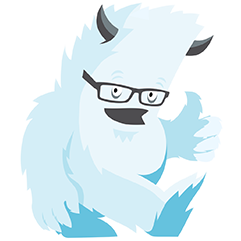 Download the map here. Signs will direct you to take a left turn onto Hwy 150 (north) to Great Sand Dunes National Park. From Walsenburg, head west on Hwy 160, right into Hwy 150. Visiting the park and wilderness is most enjoyable between May and October when the temperatures range into the 80’s at the lower elevations and 60’s at the highest elevations. However, backcountry camping on the sand dunes is not recommended in the middle of summer as the sun can cause the sand temperatures to skyrocket. Medano Creek Flow: Medano Creek peak flow varies from year to year. Normally it is during late May or early June. The National Park Service has a free park map that can be enlarge by clicking on the thumbnail provided. 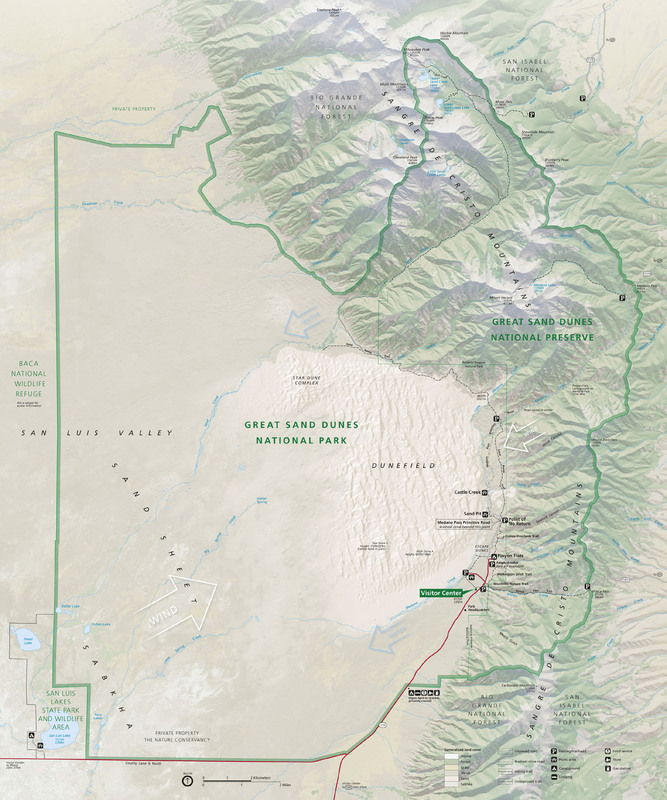 For a better, more detailed map, use the Trails Illustrated Sangre de Cristo Mountains / Great Sand Dunes National Park & Preserve Map. I recommend using a detailed topo map (like the Trails Illustrated map) for all backcountry visitors. 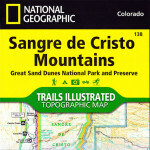 National Geographic Trails Illustrated Map of Sangre de Cristo Wilderness and Great Sand Dunes National Park and Preserve and the surrounding areas including the roads near Crestone and Westcliffe, Colorado.